It is well reported that exercise is a vital component to leading a healthy lifestyle. The Physical Activity Guidelines for Americans (PAG) are in place to outline and support the minimum amounts of activity that adults, including those with disabilities, should get per week. For some, achieving the PAG may be a simple feat, but for others, such as people with disabilities, physical activity opportunities might be an exercise in frustration. People with disabilities are more susceptible to barriers to physical activity most often reported in the areas of architectural, programmatic, and attitudinal. Architectural barriers include physical obstacles to inclusion, such as access to buildings or outdoor facilities. The Americans with Disabilities Act (ADA) ensures equal opportunity for individuals with disabilities; Title III of the ADA applies to public accommodations, including fitness centers. Many people with disabilities can physically enter a fitness center, only to find that there is no equipment accessible to them. 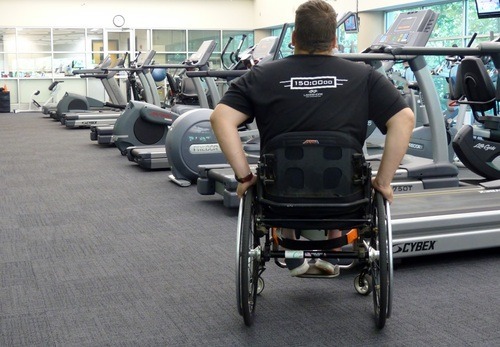 The intent of the ADA is that people of all abilities can equally access all public accommodations; in the case of fitness centers, this means being able to enjoy all membership benefits and access to fitness equipment. This is not always the case, but efforts to address this barrier and promote universal design are well underway. In August of 2013, the American Society for Testing Materials (ASTM) approved two new standards for inclusive fitness equipment. These standards provide specifications for fitness equipment that is accessible to users of all abilities and will be used to ensure future development and use of fitness equipment that more closely meets the intent of the ADA. There is a ripple effect to be seen from the approval and implementation of these standards of inclusive fitness equipment. Equipment manufacturers will be able to refer to the design standards when developing new products, while fitness centers will refer to the standards when selecting fitness equipment. An increase in the availability of accessible fitness equipment in mainstream fitness centers will give all persons the opportunity to be physically active. Increasing activity levels will result in a decrease in secondary conditions and health costs, and an increase in social interaction. A healthy, inclusive community is achieved when people of all abilities have equal access to physical activity, health promotion, and healthy eating opportunities. NCHPAD, in partnership with Beneficial Designs, recently developed a new resource titled “Discover Accessible Fitness: A Wheelchair User’s Guide for using Fitness Equipment”. This resource can also be used by fitness professionals to become familiar with key considerations for wheelchair users using fitness equipment and to broaden their knowledge to help more people. This guide discusses safety, stability, adaptive equipment, accessibility, exercise precautions, and a full overview of the components of fitness including cardiovascular, strength, and flexibility. Flip through the online guide and download to discover the benefits and possibilities of accessible fitness!